I've had quite a few requests asking how I store stuff so I thought I'd share a few tips with you. I'll be back on the cartridge challenge in the next few days. This is a crate filing thingy from Walmart - 5 bucks maybe? I have 3 paper pads in the back and a cardboard backing 12x12 on the top of the files. I keep that there to keep dust and cat hair away from my embellishments. As you can see I have hanging files and then folders with categories. Pets, Seasons, Holidays, etc. I just came up with this system yesterday. Before that all my stuff was thrown in drawers labeled 'embellishments' and I got tired of rooting thru them for what I wanted. Now I can find them WOOT! 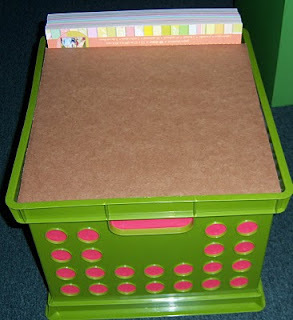 Look at those cute lil clips (click photo to enlarge) I put 2 on my paper stand for scissors and foam squares. On the side I put one to hold older mats I need to recondition. The 2nd photo shows 2 more clips for scissors and a ruler. These are 3M and I found them in the picture hanging section at Target. They have foam tape on the back that sticks to the wall and won't damage it (so it says) 6 of these hooks were 4 bucks and some change. Which brings me to Ribbon - I need a new system people. Look in the picture above and see 4 stacks of ribbons but that's not all I also have 2 12x12 drawers full and my hanging rod is FULL. What is my obsession with ribbon now? If you have a suggestion I'd love to hear it. 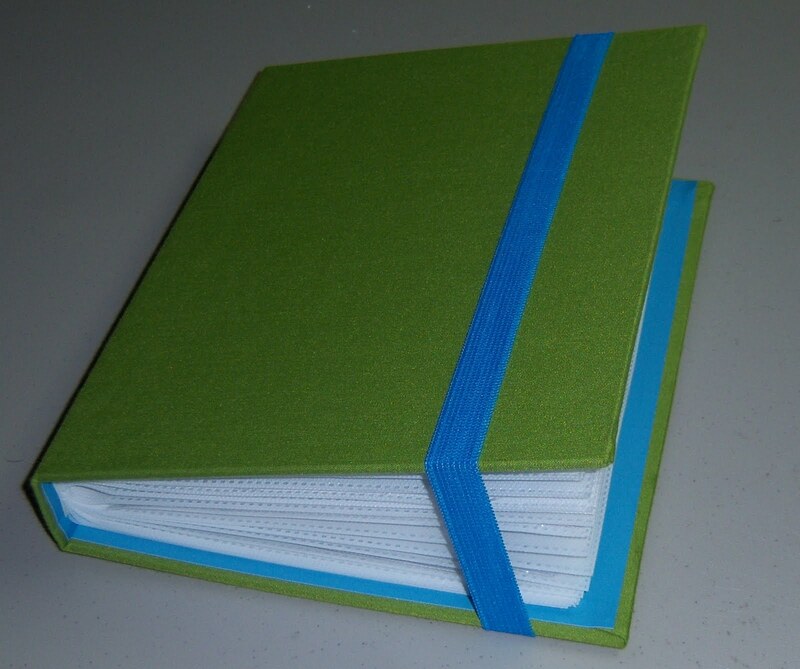 How do you organize your scraps? 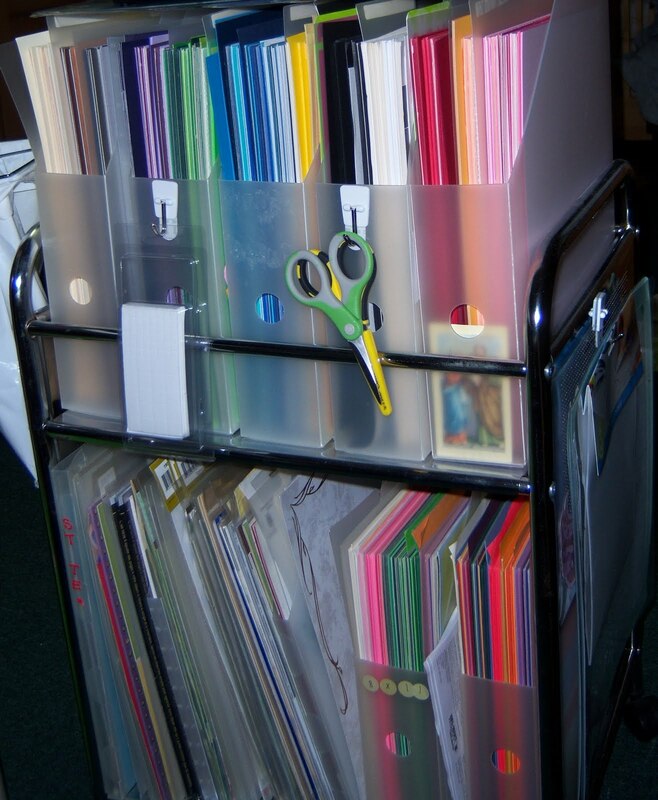 I bought a 12x12 accordion file and it's getting mighty full! I have it separated by colors. 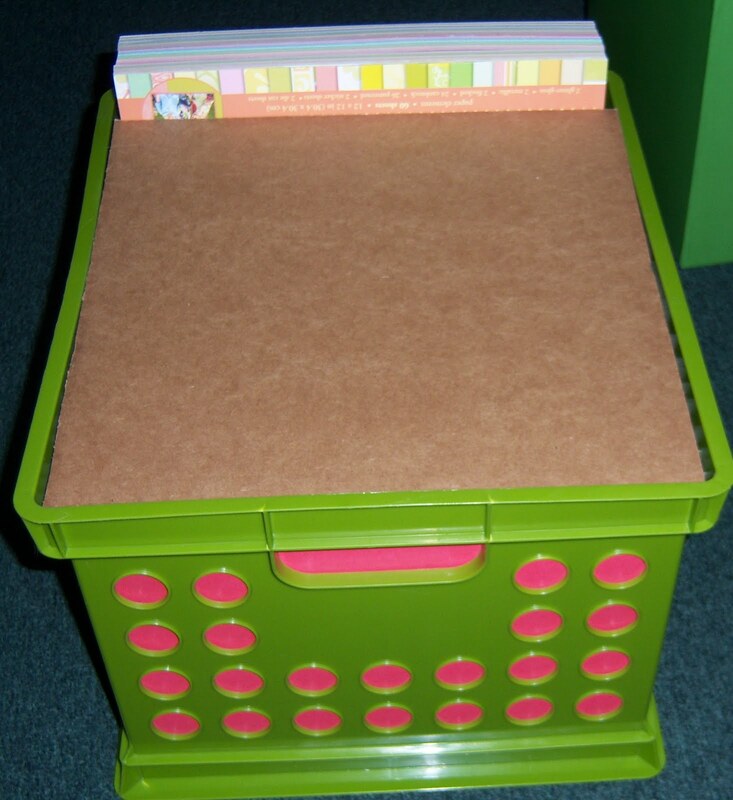 I love the 12x12 drawers at Target - I have had 2 sets (under my desk) for YEARS and yesterday I bought 3 more sets. I would have bought more but they didn't have any more. But looky looky! 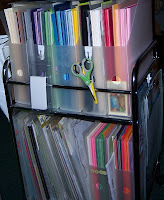 And finally - my storage 'system' for cuttlebug embossing folders. What do you do with yours? There you have it - would love to know what you do. Please send your links or photos. Great ideas. I will definitly use some of these. Soooo organized - love it ! Thanks for sharing your ideas. I am moving house in 2 weeks and have to set up a new scraproom so all ideas are great.